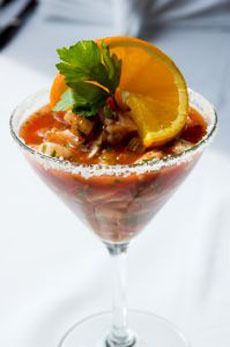 Use kosher salt or sea salt to rim a martini glass for ceviche or other seafood cocktail. Photo by Jake Martin | SXC. This is Page 4 of a 7-page glossary. Some of the terms below include Hawaiian sea salt, Himalayan salt and kosher salt. After you’ve read up on sea salt, take a look at our many other food glossaries—an easy way to get up to speed on almost 100 different food categories. or in part. You are welcome to link to it. Artisan salt is hand-harvested in small batches all over the world. It can be evaporated in ponds or salt pans from any body of water. 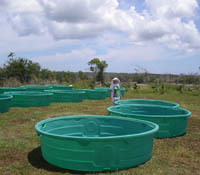 Areas that do not have coastal land available can evaporate the salt in tanks, as shown in the photo at the left. Based on the body of water, the salt will vary in texture and moisture content. The popularity of artisan salt has created cottage industries in artisan salt. Cayman Sea Salt is an example, located in the popular Cayman Islands tourist destination, between Cuba and Mexico. This salt is created with purified sea water that is evaporated in pools with purified black lava rock to add minerals. It is then dried in a greenhouse. See alaea. The photo shows a coarse bland of the salt shown on Page 1. Alaea Hawaiian sea salt. Photo courtesy SaltWorks.us. A chemical element found in the body’s thyroid hormones. A small amount of iodine is important for proper nutrition in helping to prevent thyroid disease and mental retardation. Salt fortified with iodine has been used to prevent deficiencies. See also iodized. Table salt that has been fortified with a small amount of iodine during processing. The Michigan State Medical Society launched a goiter prevention program using iodized salt in 1924. 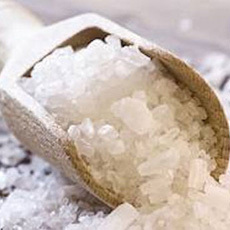 The project was the result of research on endemic goiter and iodine deficiency by David Marine, the “father” of iodized salt, and his co-workers. The program was successful, and people were urged to use iodized salt to prevent iodine deficiencies. Ultimately, the product’s use eliminated iodine deficiency in North America. 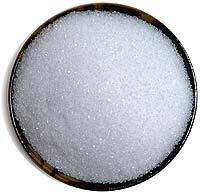 Today, 70 percent of the table salt sold in the United States in iodized. However, today’s diets are generally well-balanced with enough iodine coming from natural sources like seafood and the iron-rich vegetables: seaweed (including nori wrappers on sushi) and the cruciferous group—arugula, bok choy, broccoli, Brussels sprouts, cabbage, cauliflower, Chinese cabbage, collard greens, horse radish, kale, kohlrabi, mustard, radish, rutabaga, turnips, wasabi and watercress. Since an adult only requires around one teaspoonful of iodine over a lifetime, eating fish once a week is enough to fulfill the average iodine requirement. Also known as black salt or sanchal, an unrefined volcanic table salt with a strong sulfuric flavor. 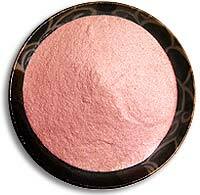 Despite its name, kala namak, which is mined in Central India, is actually light pink in color. It is mineral-rich and most often used to flavor Indian dishes like chaats, vegetable and fruit salads. See also black salt. Kala namak or black salt. Photo courtesy SaltWorks.us. Sea salt that has been roasted in bamboo cylinders plugged with yellow clay. The The salt absorbs minerals from the bamboo and clay, which in turn leach the salt of impurities: the result is an intensely salty flavor. It is used in dishes such as kimchi and grilled fish and for preserving abilities. Many Koreans use bamboo salt for its nutritional value and as an aid for indigestion. 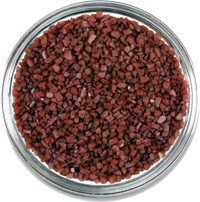 A coarse grained salt where the grains have been compressed, creating a flatter, flake rather than granule shape which has a lighter weight that sticks better to food. It is not kosher in the sense of conforming to Jewish dietary laws (all salts are considered pareve, neither animal nor dairy), but got its name due to its long history of koshering meat. The coarse and rough surface adheres to the meat easily, enabling the blood within to be drawn out, and thus become koshered. Kosher salt is saltier and less pungent than ordinary table salt, and dissolves more easily; thus many chefs prefer using it. Its larger, visible flakes also make good toppers for food like pretzels; and its adhering qualities make it good for salt crusts on fish and glass rims. Kosher salt has no iodine. Most kosher salt sold is not sea salt. Kosher salt. Photo courtesy SaltWorks.us. A product with 140 mg of salt or less per serving. See also very low salt and salt-free.